Her childhood idol was Hulk Hogan and her favorite pro was the cocky Curt "Mr. Perfect" Hennig. She was trained by the powerful brawler Ken Patera and Harley Race taught her how to be tough...while also bending the rules to her advantage. So is there any surprise that Ms. Natural has become one of the roughest and most-arrogant heels on today's indy wrestling scene? Expect to see a tough, all-out, anything-goes brawl whenever Ms. Natural steps into the ring! Ms. Natural slaps a sleeper on Hellena Heavenly. 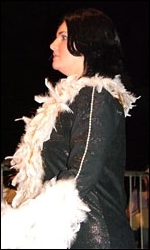 Ms. Natural poses with her WLW Championship Belt. Payback time: Heavenly stretches Ms. Natural! Old-school! When was the last time you saw a female wrestler come to the ring in a robe like this? How It Started: Like most people my age, I grew up watching Hulk Hogan. I fell in love with the way the crowd responded to him when he came out and how the good guy always defeated the bad guy (for the most part). It sent chills up my spine whenever his music hit and he came out to the ring. And yes...I cried like a baby when the Warrior beat him for the belt at Wrestlemania! Gimmick: After coming back, I am still the same wrestler but the crowd likes me a lot more than in the past. I take no crap from anyone. Wrestling Style: I was trained by two of the best. Ken Patera taught me more of the power wrestling and brawling. Harley Race taught me more of the old-school and technical wrestling. Gear: I have a new outfit that is red pleather. I also have an over the top robe that I absolutely love! Titles Held: Ken Patera'a AWA Women's Title (3x); Harley Race's current WLW Ladies Champion(5x); SDW. Biggest Win: Beating Heather Savage for my first WLW Ladies Belt. Favorite Type of Match: I prefer one-on-one. Favorite Moves/Holds: "The Hat Trick": Knee to the gut, running knee to the head, and then a knee drop to the head. Finisher: "Natural Disaster": A Fisherman Neckbreaker into a Fisherman Suplex. Biggest Allies: Josie; Tracy Brooks; ODB; Christie Ricci; Little Jeanne; Hellena Heavenly; AJ Sparx. Most-Hated Enemies: All of them when they step in the ring against me. Toughest Opponent(s): Every one of the girls I step in the ring with. You have to learn the best and most effective way you can overcome them. Career Highlight: I've had a lot of great matches with these girls in the past. So I'd have to say my whole life in the business is a highlight. Favorite Wrestlers: I'm still a huge Curt "Mr. Perfect" Hennig fan. I liked his style of wrestling and he was the most cocky guy in the ring to date. Wrestling Ambition: I'm cheesy. I would like to become a household name. Then eventually use my name to help raise money for children who are under privileged. I love kids because I'm the biggest one at heart! As of now, my husband and I and our one year old bought Sweat Gym next to Harley Race's Academy.....WLW is currently on Ozark TV 98.....I love spending time with my family.....On my daughter's 1st birthday, I also became the five-time WLW Ladies Champion.....Other than that, life is pretty much boring...and I love it!